The SmartFix offers outstanding features. It is a combination volt and current meter. Easy to use when measuring fence performance. Use the device to measure the current and trace short circuits in your fencing. The display points you in the direction of the short. This makes finding the fault quick and easy, which saves you time and trouble. The SmartFix is suitable for any fence, from HT Wire to 40mm tape. Never use the SmartFix to measure the power directly on the device, but from a distance of at least 10 metres. Pinpoints faults quickly and easily whatever the wire type or energiser is uses. By simultaneously measureing the flow and voltage, the SmartFix will follow the current flow to any one of a series of faults. 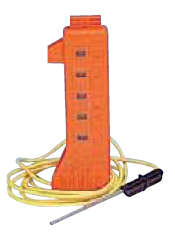 An important tool that can be used on any electric fence from a single wire to a more complex multiwire system. Supplies exact information on the condition of your fence. Makes targeted trouble shooting very easy and efficient. Auto ON/OFF. Helpful tool for checking earthing systems. 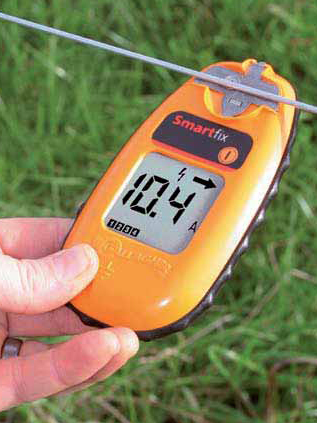 A convenient tool for checking whether ther is sufficient voltage at the electric fence. Not suitable for checking earthing systems.